The Bleak screen of Sadness™ 😢 that users encounter when installing/updating/deleting plugins or themes is a terrible experience WordPress users. It’s not timely anymore and doesn’t reflect the values WordPress strives to adhere to. Instead, WordPress needs a simpler and more straight forward experience when installing, updating, and deleting items. That’s why the Shiny Updates Team is proposing a merge of the Shiny Updates plugin into WordPress 4.6 💥. We’re eager to hear feedback from WordPress core contributors and users alike. The Bleak screen of Sadness™ is disruptive to user workflows, pulling them out of the context of plugins or themes, and dropping them into a screen filled with technical details that most users don’t care about or don’t understand. Shiny Updates deals with these details behind the scenes, maintaining the context of the triggered actions and leaving users with clear actions and results. This caters to two core principles of WordPress, designing for the majority, and striving for simplicity. Users don’t really care about the internal process of installing or updating themes and plugins. Listing out these technical steps for them is unnecessary at best. With Shiny Updates these actions also don’t require a page reload anymore, which creates a simpler workflow without context changes and lets users achieve their goals of an enhanced WordPress experience quicker. 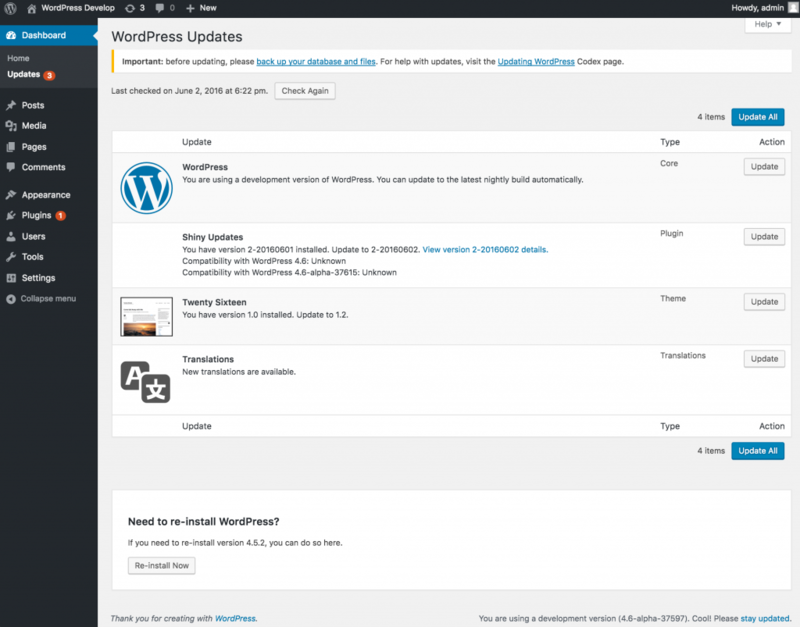 Whether it was through the update mechanism available under Dashboard -> Updates or the automatic updates introduced in version 3.7, WordPress has always been encouraging users to update their sites to the newest versions. Plugin updates have been made shiny in WordPress 4.2, but now we want to extend this to other areas as well. Shiny Updates v2 improves the update process for themes, translations and even WordPress itself, as well as install and delete workflows for plugins and themes. As of today, the plugin has been downloaded about 8,000 times and is actively installed on over 1,000 WordPress sites. We’ve gotten input from many users and core committers through GitHub and during regular meetings in the #feature-shinyupdates. You can read more about the shiny updates flow with various visual records on make/test, where we also shared results of the various user tests we did. Doing multiple rounds of user testing has really shaped the whole project and helped us refine the plugin and improve the overall usability of installing updates in WordPress. Merging Shiny Updates into core would resolve a long list of outstanding trac tickets related to updates, including #31529, #31530, #31531, #31532, #31534, #31535, #31773, #33637 and #35032. All tickets related to Shiny Updates can be found here. There are a few remaining bugs on GitHub, which will be resolved by Friday, June 3rd. Since the revamped updates table relies on plugin icons being returned by the Plugins API, the API needs to be changed as part of the plugin directory update. The new directory will launch well before the 4.6 release, so that shouldn’t be a big deal. As a bonus, this change would also enable us to fix #30186. This is a proposal and is subject to revision based on your feedback. If you haven’t already tried out the plugin, please download and install it from WordPress.org or the comfort of your WordPress admin. You can review the current code and leave feedback at the project’s GitHub repository or in #feature-shinyupdates on Slack. Thanks a lot to everyone who has been contributing to this plugin since its inception, especially @obenland for leading this project, @adamsilverstein for his numerous contributions, @mapk for helping with testing and UX, and @ocean90 for giving valuable feedback despite being super busy with leading 4.6. So far we’ve received positive feedback from different core teams like the accessibility and design teams, and we have reached out to @drew who will review the docs once a core patch is ready. For the past 6 years, users have been able to embed YouTube videos, tweets and many other resources on their sites through a nifty feature called oEmbed. Today, we (mainly me, @pento and @melchoyce) ask to consider extending this feature by merging the oEmbed API plugin into WordPress core. This plugin allows anyone to embed posts from your site by just pasting its URL. We’ve been working hard on it for months and are now eager to hear your feedback. While I initially built an early version of the plugin about a year ago, it was @melchoyce who kicked things off with #32522. Her idea was simple: When you can embed almost anything in a WordPress post, why aren’t we able to embed WordPress posts themselves in another WordPress post? That’s exactly what we’re aiming for. Our goal is to allow a big portion of the web to easily and securely embed such post previews. We use iframes with the sandbox attribute to enable extra restrictions on the content that can appear in the inline frame. Long story short, the feature works with all major browsers and degrades gracefully on older IE versions. The plugin was developed in such a way that merging it into core eventually is as straightforward as possible. We are working actively on a patch that can be added to core within the merge window. This feature only works with oEmbed discovery turned for every user, even those lacking the unfiltered_html capability. That capability check needs to be removed. This plugin adds a new /embed/ rewrite endpoint for posts, pages and attachments. We haven’t found any plugin in the directory using this endpoint, but if you already use that endpoint, you should consider renaming it or changing the oEmbed rewrite endpoint using the filters we provide. Note: There’d be a separate post for this after the merge. What about the REST API? The plugin works well on WordPress 3.9+ and uses a simple class to return the oEmbed API responses. However, with the REST API officially proposed for a core merge, we built a controller class for it. This class does exactly the same and follows the REST API best practices. We could definitely profit from the REST API and built upon it when merging into core. Not needing a fallback means no duplicated code and easier maintenance. Besides that, there are also some small layout quirks we still need to work out. Meanwhile we’re continuing to improve the codebase and inline documentation. We’re looking into improving support for different response types in addition to regular post content, depending on the feedback we receive from users. While I’ve been the lead developer of the plugin, a ton of valuable input and contributions have come from others in the community. We on the REST API team (myself, @rachelbaker, @joehoyle, @danielbachhuber, and newest member and core committer @pento) would like to propose merging the REST API into WordPress core. We’ve been working a while on this, and think it’s now ready to get your feedback. What is the REST API? Why do we need a new API? WordPress already has external APIs: XML-RPC, designed for desktop clients; Atom and RSS feeds, designed for post syndication; and the venerable admin-ajax, designed for Ajax requests in the admin and frontend. These APIs all serve different purposes, but often have a great deal of overlap. In addition, these have all been stretched beyond their original intentions: XML-RPC now contains site management tools, RSS has been extended into the WXR export format, and admin-ajax is the catch-all of any sort of browser-server communication in plugins and themes. The REST API builds upon the heritage of these APIs to provide better support today for using these, as well as laying the groundwork for expanded use in the future. XML-RPC is the closest analogue to the REST API in terms of usage and capabilities. Originally designed back in 1998 to allow desktop clients to create and edit posts on blogs, WordPress has extended this with both other specifications (such as MetaWeblog) and with its own proprietary additions. Fundamentally, XML-RPC is built around Remote Procedure Calls (RPC), essentially a way of calling a function externally. It then uses XML to serialize the data for passing back and forth. The admin-ajax API is also very commonly used in WordPress, albeit typically only by plugins and themes. This is a very lightweight API that essentially acts as a mini-router. Typical usage of this API uses JSON, since it’s a browser-based API, but all usage is completely custom. A lot of the usage of this involves retrieving or updating posts on-the-fly, but due to its nature as simply a framework, these are done in completely different ways. This doesn’t lead itself to extensibility, and requires a lot of duplication every time developers want to get data in or out. We don’t want to replace all of admin-ajax though, since some use cases don’t map exactly: UI-related interactions or things like the Heartbeat API are great examples of this. The REST API can help to supplant these uses. Our aim is to eventually replace the XML-RPC API completely, to act as a secondary import/export format, and to replace most (but not all) uses of admin-ajax. The REST API offers an easier to use interface than the existing solutions. We’ve been working on this project ever since the first WordPress Contributor Summit back in 2012. Since then, we’ve had lots of feedback from core developers, the community at large, and further beyond in the form of client developers. We believe that the REST API has an immense amount of experience behind it, and plenty of viewpoints have contributed to the project’s direction. We also designed the API from the ground-up to be part of core, following a core-like mentality to our processes. The API is intended to be both a great feature and a base to build off in plugins. We undertook a significant refactoring and partial rewrite in version 2 to make this extensibility even better. This open process also means that most of the design decisions are documented publicly as we’ve engaged stakeholders to gauge feedback. The plan we’re aiming for is a two part merge of the API. For the first stage, the infrastructure code would be merged into wp-includes and made available for plugins and themes. This is an internal API only, but offers an “API construction kit” for developers to use. For the second stage, the endpoints would be merged, and the API would be enabled for sites by default. Stage One: Infrastructure: The infrastructure is the code responsible for routing requests and handling the “meta” layer of the API, including JSON serialisation/deserialisation, linking, embedding, and REST best practices. This adds a simplified routing layer outside of WP’s rewrites, allowing non-query-var rewrites easily, acting as a base for building APIs inside WordPress. Stage Two: Endpoints: These are where much of the complexity of the API lies, as they’re responsible for mapping data from the external JSON format to the internal data structures, and vice versa. The “business” logic of integrating with WordPress is almost entirely contained within the endpoints. These are the more complex part of the API, as they require using deep APIs in WordPress, and handling security and privacy concerns. With this plan, we would aim to have the infrastructure merged in 4.4, and the endpoints merged one release later in 4.5. The slow nature of this plan allows a longer review time on the API for core committers. It also gives extra time for reviewing the endpoints, since they would be delayed one release. Merging the infrastructure now would allow third-party code to begin using the API to build upon it, including migrating from existing custom code. It would also help to increase developer confidence in the API (as it represents a commitment by the project towards a REST API). In this plan, the first stage would not include any of the base controllers (such as the posts controller). This may limit the utility of the infrastructure for plugins and themes, however as the endpoints would be merged a cycle later, it’s expected that this wouldn’t have a huge impact. The infrastructure of the API is approximately 2700 lines of code (roughly a third of the API codebase), and the endpoints make up the remaining 5500 lines of code. What would happen after merge? Once we’re done with the parties, one major question would be how we manage the API in the future. The existing management and contribution process via GitHub has been extremely successful, as we’ve had 61 people’s pull requests merged into the API. Contribution via GitHub is especially useful for the API, as it’s a heavily developer-focussed project, and is aimed at external (non-WordPress) developers. On the other hand, all other contribution to WordPress is done via SVN and Trac, so integrating with this process is important for existing developers, as well as core’s general processes. We need to ensure the API is an integral part of core, not a separate project. In addition to the project management, there are still further API projects we need to tackle. Authentication is the most important of these, as a huge focus on OAuth and similar would be needed to make the API more useful for external clients. Currently, we haven’t had enough time to spend on this as well as managing the API project, however the API is now reaching a finalised stage, so this should be able to improve quickly. Centralised authentication is a huge part of this, as the regular OAuth registration process is cumbersome for a distributed system like WordPress. Important note: We don’t believe authentication is required for the API merge, and we treat it as a separate project. The authentication is a completely separate system to the API itself. This is something we’d give more time to in the future, but we want to focus on shipping the API for now. This is our merge plan for the API, however it’s not finalised. If you’ve got comments, thoughts, suggestions, opinions, or words of encouragement, let us know. We’d love to know what you think. Thank you all, you’re wonderful, and stay golden. The Customizer team is proposing to merge the Menu Customizer plugin into core for WordPress 4.3. In this post, I’ll outline the purpose and history of this project, as well as highlighting the improvements that we have made. Menu Customizer started out as my Google Summer of Code 2014 Project. The initial proposal and revised schedule highlight the initial goals and provide good perspective for where we’ve come in the past year. See also the periodic posts here on make/core for updates. Development has happened on GitHub since the project opened to the community. As I began developing this feature in plugin form, it became clear that the core Customizer API would need a lot of improvements to support something as complex as menus. Countless tickets have worked towards this goal over the past year, from the addition of the concept of Panels ( #27406) to JS/Underscore-templated controls ( #29572), and now, full support for dynamically-added sections and controls ( #30737, #30738, and #30741). Developers are still realizing the full potential of the Customizer API, and Menu Customizer pushes the boundaries of what can be done here pretty far. One of the goals with our approach is to bring as much functionality that should be natively available in the API into core as possible. With the improvements made here already, as well as the future potential to continue abstracting functionality like the add-menu-items fly-out panel or the ability to add screen options in Customizer Panels, Menu Customizer broadens the potential for developers to extend the Customizer to do anything, in core, plugins, and themes. In the initial GSoC project, I (@celloexpressions) developed the plugin from scratch, using Widgets in the Customizer as the design basis, with @ethitter and @obenland serving as my mentors. When the project was opened to the community for contributions, several designers and developers stepped up to help. Code contributors to date include @westonruter, @valendesigns, @voldemortensen, @adamsilverstein, and @kucrut. @designsimply and @folletto have also put in a tremendous amount of time helping with design and usability. I’ve posted a comparison of the mobile menus flow in the admin and the Customizer on make/flow, and @designsimply has also posted flows there (more flows with more recent versions of the plugin on trunk are still needed). Usability testing has been conducted on usertesting.com, with results posted on make/design. As further refinements are made, additional testing and feedback can be incorporated to make the new experience as polished as possible. A couple of technical details: each menu is a Customizer section, and new menus can be added (dynamically adding new Customizer sections and controls in the process). Menu items are Customizer controls. To maximize scalability, menu items are all rendered using a single JS template, only when their containing menu section is expanded. The add-menu-item panel loads available menu items on an as-needed basis via ajax. The plugin uses several custom Customizer objects including a custom panel that implements screen options, two custom sections (menus, for lazy-loading of menu items, and new menus, which is rendered as a button toggle), and several custom controls. But everything is built off of the core Customizer API. This project has a very explicit goal of not just adding menu management to the Customizer, but also removing the existing admin page in the process. The menu management screen has significant, fundamental problems in its implementation and will never scale (see #14134) without a significant refactoring along the lines of what we’ve done with the Customizer. Additionally, the new UI in the Customizer is considerably more polished than the admin screen and already includes numerous features and bugfixes proposed for core (see above). Ultimately, the new UI provides a much better experience for all users, including desktop, mobile, accessibility, etc. Immediately and officially “deprecate” it: wind down any ongoing development efforts and focus all new administration-focused Menus component work on the new UI in the Customizer. Update trac tickets accordingly, and add a “Manage in Customize” link to the existing screen. Any existing tickets proposing enhancements or new features for menu administration would be required to be adapted to the Customizer version, with the (discouraged) option of also making changes to the old screen. Point the “Menus” link in the admin bar to Menus in the Customizer in 4.3. Remove that menu from the admin bar in 4.4 in favor of a top-level Customize link, and put something more useful in its place (as all of its core links will point to the Customizer now). Retain the admin screen codebase, along with existing links to it throughout the admin. In WordPress 4.5 or 4.6, remove all core links (including admin menu) to the Menus admin screen, or point them to the Customizer. This would likely coincide with a similar change for Widgets and Themes to use the Customizer versions exclusively, once full feature-parity is achieved with the Customizer versions of the other features (Menus has it now). At this point the admin screen would be accessible only by plugin-added links or for users who cannot access the Customizer (no-js, IE7, IE8&9 with domain mapping, a very small percentage of users overall). The admin screen and related code would likely not be removed entirely from core in the foreseeable future, and critical bugs or security issues would still be addressed. New feature development and enhancements would be restricted to the Customizer version. The above plan is fairly aggressive, to eliminate any ambiguity about future plans and intentions and to avoid the potential for mass trac ticket rot. The fact that the Menus component has no maintainers and has not received significant attention since the 3.6 release indicates that there is a general lack of developer interest in dealing with the mess that the current system is. I am willing to step up as a component maintainer for Menus if the above plan is implemented. We have a few issues left that work working on. Notably, @westonruter has proposed refactoring the way menu item settings are handled, along with menu creation and deleted, and has begun work there, but wouldn’t finish until after a core merge due to time constraints and integration with core code. @adamsilverstein is working on improving drag & drop to work with sub menus. There are also several minor issues remaining on GitHub, which would either be handled in the next couplle days or after merge (many issues have been punted to after a potential merge already). Press This is a redesign of an existing feature with a focus on automation, speed, and mobile usability. Download the plugin and check it out for yourself! One of the requirements of core is at least feature parity with the old version of Press This. Here’s a comparison chart of where the new Press This is. A number of TinyMCE buttons are removed intentionally. Only necessary WYSIWYG buttons are shown now. Not only is it included, but it’s quite a bit smarter than the previous one. Now is actually quite exposed in the UI. So which problems are we solving? What brought us to this solution and what other potential solutions did we explore? When we were initially exploring designs and ideas, a few people suggested just improving Post New. The main reason we opted not to was speed. Post New comes with all of wp-admin and its files. It’s a bit of a beast. We wanted an extremely light, extremely fast (both in performance and in usability) way to post and keeping Press This was a good way to go. We can also pull the ideas and techniques we like back into Post New if successful and useful. We experimented with SVG icons (one less http request, but ultimately removed as Dashicons are required for the editor). We planned to use the upcoming API. We have trimmed down stylesheets and JS (only the styles necessary for a PT view). There is no extra UI that could get in the way of going from 0 to published post. Press This also has the luxury of being able to fall back to the full editor (via Save Draft) for those that have plugins and other features the need to set before posting. We did a couple rounds of usability tests. One for a11y and another with some new users. Both had tremendous difficulty in even adding the bookmarklet. @marcelomazza did a pretty solid job fixing up the add bookmarklet screen. We ran into a number of a11y issues and addressed as many as we could. Could still use another round of a11y testing. Once the new users figured out how to install it, they didn’t have many issues creating a post. I’d like to do more with ultra Space Jam pro users like yourselves. And thanks to all the testers so far! Customizer Theme Switcher brings theme-browsing and theme-switching functionality into the Customizer. By integrating themes directly into the Customizer, live-previewing workflows are greatly simplified, and the relationship between themes and theme/site options is clarified for the user. This plugin represents a significant step in moving all “Appearance” functionality into the Customizer, following Widgets. The future roadmap includes Menus, Theme-Install, and iterations on widgets that would allow the Customizer to entirely replace those admin screens for most users. Because the Customizer Theme Switcher plugin does not address theme-install, the admin page (themes.php) is fully intended to remain in use for now. We are proposing to redirect the front-end “Themes” link (in the admin bar) to the Customizer, as was done for widgets in 4.1. The code is heavily Backbone.js-inspired, leveraging JS-heavy portions of the Customizer API to do things like underscore JS templates for rendering theme data. Most of the code is directly adapted from the Backbone-driven themes.php system (and the theme data is retrieved with existing functions), but things like the search/filter are written from the ground up to leverage the Customizer API (in that case, conditionally activating/deactivating controls). In keeping with the goal to avoid back-end functionality changes, theme-switches are accomplished simply by leveraging the existing ability to pass a theme as a URL query arg when loading the Customizer; ie, the Customizer is simply reloaded to preview a different theme. Loading overlays are leveraged to make this process seem more instant. Unrelated 4.2 core work around Customizer Transactions could potentially improve how this works. Remove #customize-info for theme previews. Change front-end admin bar Themes link to point to themes in the Customizer (deep-linked). When a new theme is activated, go to the home page (front end), not the themes admin. If user doesn’t confirm that they want to leave unsaved changes, remove the customize-loading body class (requires core patch). Move custom section and control to class-wp-customize-control|section.php in wp-includes. Merge all CSS into customize-controls.css, scope to .wp-customizer. Move .themes-panel-back to the Customizer header, adjust JS accordingly. Merge JS into customizer-controls.js, after the respective object types. Merge customize_themes_template() into wp-admin/includes/theme.php, at the very end. Make sure that this file is included at the appropriate time as needed when adding the Customizer controls. Merge remaining PHP (all in Customize Register callback) into register_controls() in class-wp-customize-manager.php. @designsimply has run four usertesting.com tests (see links in #core-customize), and we haven’t really seen any ongoing issues with the actual theme switcher. It has been difficult to get users to follow our instructions, but when they have used the themes-in-Customizer UI, the interactions have been fairly seamless and as-intended. Further testing could be beneficial after merge, but we think that in-person testing and feedback is generally going to be more effective for this particular plugin. The exact handling of the themes header display still needs some work – the backwards-sliding works well but the arrows to indicate it don’t. @folletto opened a ticket on core trac to work through some alternative options. Most of the accessibility issues have been fixed as well (@afercia please let me know if I’ve missed any), with the exception of the Themes section header, which will happen along with the UI changes there for everyone. A future phase of this project will explore integrating theme-install in the Customizer and minimizing the distinction between installed and available themes. Due to the larger UI and UX changes proposed with that effort, we’ve decided to hold off on theme-install for now so that the basic theme-switching functionality could be built on a reasonable timeline for 4.2. This is similar to the manner in which the “THX” feature plugin team re-did themes in 3.8 and theme-install in 3.9. 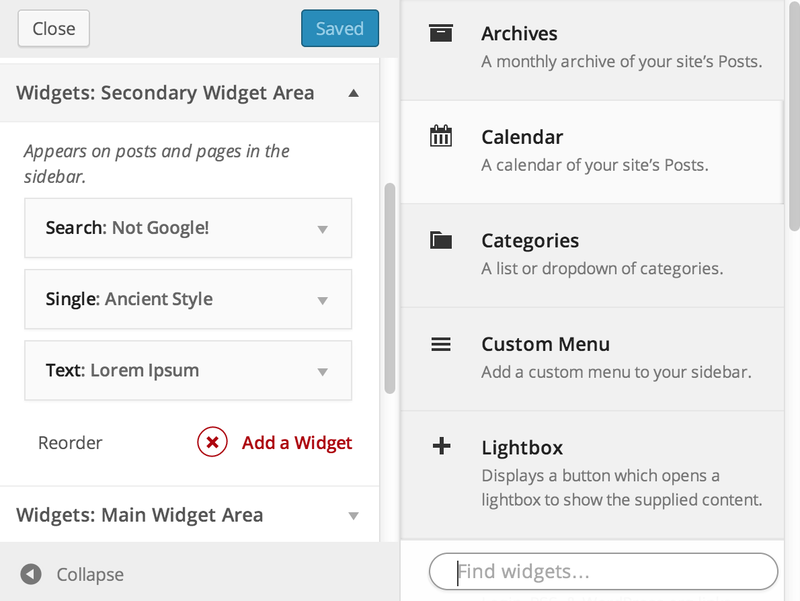 Widgets in WordPress provide an easy way to add functionality to predefined areas of your theme templates. 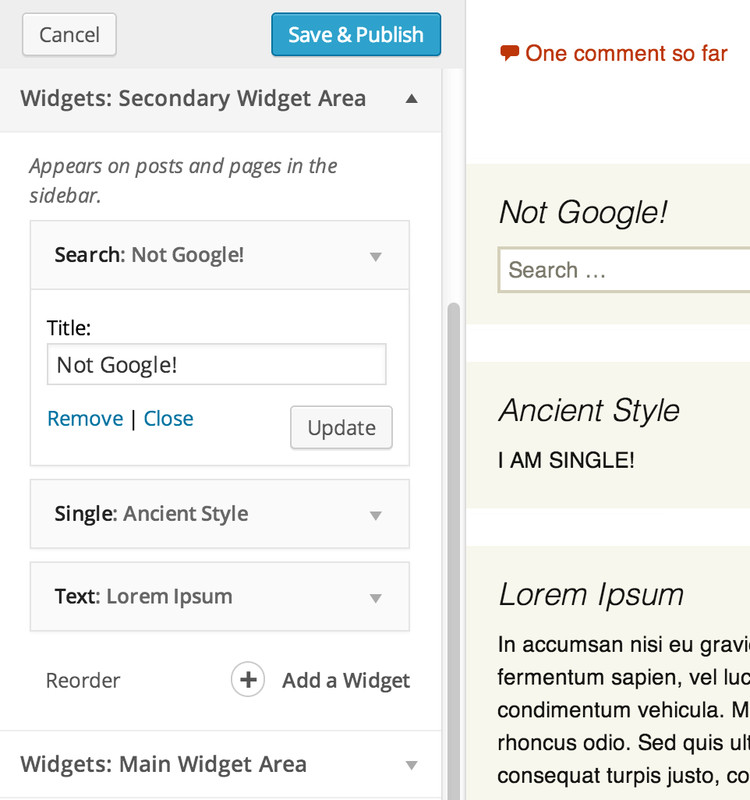 However, once you add a widget to a sidebar you have to leave the WordPress admin to go back to the frontend to actually see how the updated widget appears in the sidebar on your site’s public frontend. While you are making these changes and experimenting with a widget, it could be completely broken and everyone visiting your site will see this broken widget since there is no core way to preview changes made to widgets. But WordPress also provides an excellent way to preview changes to various settings on your site via the (Theme) Customizer. Changes made when using the Customizer are not visible to site visitors until you hit Save & Publish. So what if widgets could be edited in the Customizer? That’s what the Widget Customizer plugin makes possible. No longer do you have to edit your widgets blind! Each registered sidebar on your site gets its own section in the Customizer panel. Within each section, widgets appear in their sidebar order. The widget controls appear there just as they appear when editing widgets in the widgets admin page. Upon making a change to the widget control, pressing the form’s Update button causes the changes to appear in the preview window; no changes to the widgets are saved permanently for others to see until you hit the Customizer’s Save & Publish button. This goes for whether you’re adding a new widget, editing existing widgets, reordering widgets, dragging widgets to other sidebars, or even removing widgets from the sidebars entirely: all of these actions are previewable. Adding a widget to a sidebar slides open a panel for browsing the available widgets, complete with the usual names and descriptions, but also featuring widget icons to help quickly identify widgets. The list of available widgets can also be filtered down with a search input. When you remove a widget from a sidebar, it is not deleted. Instead, it is moved from an active sidebar to the “Inactive Widgets” sidebar which can currently be seen on the widgets admin page. As such, removing a widget now is the same as trashing a widget.